The Neutrik NTI "Minstruments" series of devices are very accurate portable audio signal generator and audio signal analysis tools. This unit is an audio signal generator and can create accurate fixed tones, sweep tones, pink noise, white noise, square waves and polarity test tone. This unit is an audio signal analyser and includes accurate measurement of signal level, relative level, frequency, THD+N, VU+PPM, polarity, CMRR balance, sweep response, 3rd Octave RTA (line input only, requires MiniSPL for mic input) and a scope mode for signal waveform. Includes a built in headphone amplifier. This unit is a factory calibrated microphone and enables the ML1 to act as a reference quality SPL meter. 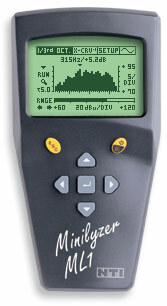 An ML1 Minilyser fitted with a MiniSPL microphone can data log SPL over time (up to several days), this data log is called an SPL/LEQ and can be downloaded to a PC using MiniLINK software. This unit is an expanded ML1 Minilyser. The unit is supplied complete with MiniLINK software and USB cable. A PC is used (via MiniLINK) to switch the modes between the standard ML1 tool set and the expanded AL1 tool set. When in AL1 mode the unit provides enhanced data logging for SPL modes of LEQ, short time LEQ, LE, Lmin, Lmax and SEL. Other tools include 1/3 octave RTA, zoom FFT, RT60 reverberation time, delay time (measures the acoustic delay time through the air verses the original electronic source signal), and optional STI-PA (speech intelligibility). The unit also measures signal level, relative level, frequency, THD+N and signal polarity. Like the ML1 the unit has a built in headphone amplifier. This is a firmware upgrade that allows an ordinary ML1 to become enhanced as an AL1. AL1 Crossgrade will only work if used with MiniLINK software and cable (not supplied). This unit analyses digital audio, it provides a wide range of tests for digital formats including EBS/EBU, S/PDIF, ADAT, TOS-LINK at sampling frequencies of up to 96KHz. Includes a data logging ability and has an inbuilt speaker and headphone amp for monitoring.